Which is Safer and More Effective –Miralax (PEG 3350) or Lactulose? A recent randomized multicenter study (D Jarzebicka et al. JPGN 2019; 68: 318-24) compared polyethylene glycol 3350 (PEG, aka Miralax) and lactulose for functional constipation in a cohort of 102 patients (12 weeks of treatment and 4 weeks of follow-up). A “good clinical outcome” was considered if there were three or more stools per week and an improvement in stool consistency of at least 2 types in the Bristol scale. My take: This study showed that PEG 3350 was more effective and had fewer side effects than lactulose for constipation in children between 6 months of age and 6 years. Everyday parents ask me if Miralax (polyethylene glycol) is safe; this has been driven by social media claims of neurotoxicity and by articles in the NY Times (see prior blog references) indicating that more testing is needed. A recent study (KC Williams et al. J Pediatr 2018; 195: 148-53) examines one of the areas of concern, whether miralax could result in toxic levels of glycols. 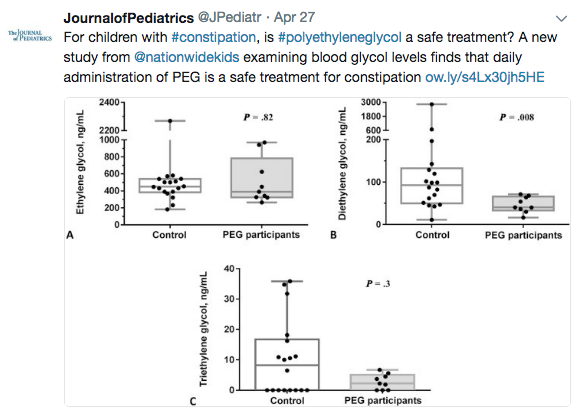 In this study with 9 treated children (ages 6-12 years) and 18 controls, careful study of potentially toxic agents, ethylene glycol (EG), diethylene glycol (DEG), and triethylene glycol (TEG), were measured every 30 minutes for 3 hours after receiving 17 g of PEG 3350. After PEG 3350 dose, EG and TEG levels remained well below toxic levels; DEG levels did not change. The increases in EG and TEG, which peaked at 90 minutes, were not sustained at levels different from controls. An important limitation of this study is that there may be other metabolites that are not measured that could cause neurotoxicity. Adequate bowel cleansing improves the results of colonoscopy. Since colonoscopy is a big part of gastroenterology/pediatric gastroenterology, a lot has been written comparing bowel preparations. A recent study has examined a split-dose polyethylene glycol (PEG) preparation (Gastrointest Endosc 2012; 75: 583-90). This prospective study from a single center in South Korea examined the effectiveness of a split-dose regimen in 366 patients (18 -65 years). An interval of 3 to 5 hours between the completion of the last dose of the preparation and the start of the colonoscopy had the highest scores for bowel cleansing. The authors used the “Ottawa Bowel Preparation Scale” for assessing a quality score. Favorable odds ratios were noted with optimal preparation interval (OR 1.85), amount of PEG ingested (OR 4.34), and adherence with diet instructions (OR 2.22). 3. Two liters of PEG on day prior and then two liters early in morning (5-7 am) on day of procedure –NPO for at least two hours prior to procedure. While taking PEG, patients were instructed to consume 250 mL every 10 minutes. Plus 0-2 points for overall quantity of fluid. In this study, a prolonged interval (> 7 hours) between prep and colonoscopy had increasingly higher scores. Score for 3-4 hours was 4.25; score for 7-8 hours was 5.20 and score for > 8 hours was 5.92. As alluded to above, individuals who consumed adequate volume of preparation, had good bowel cleansing. 99% of patients who took at least 75% of PEG (> 3 liters) had a satisfactory preparation. And, 95% of patients who took less than 75% of PEG had an unsatisfactory preparation. Compliance with diet instruction was associated with a satisfactory prep in 89% and poor compliance was associated with a poor prep in 81%. While this study identified these risk factors, it is telling that even in a research study, 141 patients had an unsatisfactory preparation (Ottawa scale 6-14); 225 had a satisfactory preparation (Ottawa scale 0-5). -JPGN 2011; 53: 71. 2 day prep: Miralax 2 gm/kg, bisacodyl 5mg. n=111. -Gastroenterol 2010; 138: 73, 27 (ed). Overutilization of colon screening in low risk situations and underutilization in high risk situations in clinical practice. -Clin Gastro & Hep 2009; 7: 1217. Fewer polyps detected as day progresses at a VA hospital n=477 pts. 27% decline in polyp detection. -NEJM 2009; 361: 1179. Review of screening for colorectal cancer. -Gastroenterol 2009; 137: 792. Use of CT colonography -current appraisal. -Ann Intern Med 2009; 150: 1-8. Says endoscopists miss most cancers on right side & colonosopy reduces cancer by ~60% primarily due to left-sided cancers. Most, 73%, of colonoscopies not done by GI/colorectal surgery in this study. -Gastroenterol 2008; 134: 1570. Update recommendations from ACS, ACR, US Multi-society task force. -Gastroenterol 2008; 134: 1311. Screening in 40-49 detects similar # of adenomas as in older groups (>50) but fewer advanced Ca. Clin Gastroenterol Hepatol 2011; 9: 577-83. The first reference examined the use of bisacodyl in a randomized, double-blind placebo-controlled study in the UK. During the 4-week treatment period, patients receiving 10mg/day bisacodyl (n=247) had increased stools, from 1.1 per week to 5.2 per week. Stool frequency also increased to 1.9 per week in the placebo group (n=121). All secondary endpoints including constipation-associated symptoms (eg. quality of life indices, physical discomfort) improved significantly compared to placebo. Average age of patients in this study was 55 years. The main adverse effect was diarrhea –mainly during the 1st week of therapy. Long-term prospective studies are not available on the use of stimulant laxatives. The second reference is a systematic review and meta-analysis of randomized controlled trials (RCTs) of pharmacologic therapy for chronic idiopathic constipation. Twenty one eligible RCTs were identified: eight laxative studies (n=1411), seven prucalopride studies (n=2639), three lubiprostone (n=610), and three linactolide trials (n=1582). All of these studies showed treatment was superior to placebo. These studies involved subjects who were mainly adults (>90% older than 16 years). The results showed benefit from both stimulant and osmotic laxatives. Overall, the osmotic and stimulant laxative studies showed higher response than the pharmacologic agents like prucalopride, lubiprostone, and linaclotide. Nevertheless, between 50% and 85% of patients did not fulfill criteria for response to therapy. -J Clin Gastro 2003; 36: 386-389. Safety of stimulants for long-term use. -J Pediatr 2009; 154: 258. Constipation associated w 3-fold increase in health utilization/cost. -Clin Gastro Hep 2009; 7: 20. Review of complications assoc c constipation in adults. -Pediatrics 2008; 121: e1334. Behavioral therapy ineffective in treating childhood constipation. -NEJM 2008; 358: 2332, 2344. Use of methylnatrexone for opioid-induced constipation & trial of n=620 of prucalopride for severe constipation. Both drugs were helpful. -Gastroenterology 2004; 126: S33. Review of pediatric incontinence. -J Pediatr 2004; 145: 253-4. Prevalence of encopresis 15% /constipation 23% in obese children (n=80). Questionnaire administered to 80 consecutive obese children.